Dale Carnegie made a fortune by helping millions understand how, why, and that other DIMwits were easily rattled, rife with emotions, and ripe for manipulation. Sans brain scanning breakthroughs, there was no way for Mr. Carnegie to understand how prejudice, pride, and vanity are easily explained by the obsessive drive to maintain dopamine flow. I’m not interested in making friends or earning a fortune conning DIMwits into believing they’re somehow smarter, better, different, or immune to an affliction keeping just about everyone from rising above dopamine-induced fears. Fears that make it difficult for some, and impossible for most, to honestly consider, discuss, or accept a concept as dopamine-repellent as dopamine-induced madness. Dopamine for DIMwits is for the few, rare, brave souls, capable of admitting to dopamine-induced fears long enough to learn how neurotransmitters turn potential humans into creatures of emotion, bristling with prejudice, and motivated by pride and vanity. Inquisitive souls interested in understanding the inanity behind the insanity undermining our species’s chances of making it into the next century. Yearning souls, eager to be free enough to stop living the lies handed them and start living lives while there’s still time. When it comes to being slaves to fears, we’re all in the same boat. If not for mass cowardice, teams of researchers would have already established how the drive to maintain dopamine flow is so powerful it reduces all choices down to dopamine appealing (yes/like/crave/seek/go) or dopamine repellent (no/hate/dread/avoid/stop). The information would provide valuable insights into why cowardice is so common and why the thought of admitting to cowardice is so dopamine repellent it keeps DIMwits choosing no, hate, dread, avoid, stop. Feeling insulted, turned off, argumentative, angry? If you’re finding it difficult to process what you’re reading it’s because dopamine is providing a valuable lesson on how brain chemicals keep us from wanting to know we’re under neurological spells. If that weren’t the case, it would be relatively easy to see through cheap tricks, such as getting insulted, turned off, argumentative, angry, and other childish ploys that effectively demonstrate how dopamine manipulates behavior. 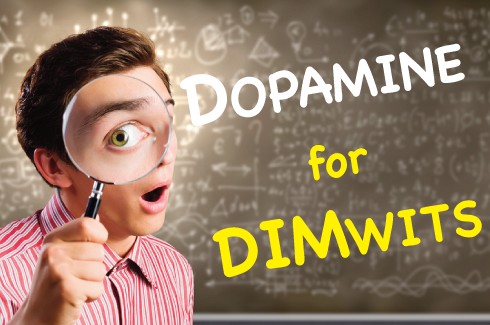 When it comes to avoiding the obvious, the difference between DIMwits comes down to how dopamine-repellent information is skirted. Mediocre minds ignore or dismiss what they can’t understand, while cowards hide from their cowardice by getting defensive, offended, or offensive. But the saddest are the fools who pull the wool over their own eyes by cleverly agreeing and then quickly forgetting what they gave themselves gratuitous credit (and dopamine squirts) for understanding. Imagine hearing about a widespread disease, responsible for irrational and inexplicable behaviors, that eluded discovery for centuries. But instead of wanting to learn more, quickly losing interest without wondering why. That’s what makes DIM the perfect pandemic – a brain disorder that keeps sufferers from wanting to understand, or even consider the possibility, that everyone’s suffering from a debilitating brain disorder. Not for lack of evidence but because the evidence is too dopamine repellent to consider. Two millennia before neurotransmitters were discovered, Confucian philosopher Xun Kuang profiled the same DIMwit fondness for dopamine-appealing pretensions over dopamine-repellent honesty. Centuries later, Dale Carnagey changed the spelling of his name (to cash in on Andrew Carnegie’s fame) and confirmed how little has changed. It’s as if DIM helped our ancestors figure out how to have their cake and eat it by fabricating a dopamine-appealing charade about being human beings. That allowed inferiors to continue behaving like apes without having to actually deal with the dopamine-repellent limitations, challenges, and annoyances associated with honesty, integrity, morality, and humanity. And all it took was a dopamine-induced proclivity for self-deception and denial, along with the lack of humanity that facilitated the elimination of any and all threats posed by conscious, honest, evolved rivals who saw through the farce. Which helps explain why Dopamine for DIMwits might forever remain too dopamine-repellent for the vast majority who get defensive, offensive, and even murderous when their deceptions, hypocrisies, and cowardice are pointed out. Sorry for trying to make you think. Years of explaining this phenomenon convinced me I’m either not smart enough to put a dopamine-appealing spin on the dopamine-repellent contents of this topic or there simply aren’t any gentle, inoffensive, entertaining, acceptable approaches to help addicts accept the possibility a brain disorder turned us all into self-deceptive addicts. Who knows? Maybe, possibly, hopefully, Dopamine for DIMwits will inspire wiser, smarter, more insightful individuals to devise nicer, kinder, gentler approaches. I’d love to see lots of creative types take up the challenge (and teach me a few things). Until then, dopamine-repellent honesty will have to do.